Do you think running a two-way ANOVA with an interaction effect is challenging? Then this is the tutorial for you. We'll run the analysis by following a simple flowchart and we'll explain each step in simple language. After reading it, you'll know what to do and you'll understand why. We'll use depression.sav throughout. The screenshot below shows it in variable view. Very basically, 100 participants suffering from depression were divided into 4 groups of 25 each. Each group was given a different medicine. After 4 weeks, participants filled out the BDI, short for Beck's depression inventory. Our main research question is: did our different medicines result in different mean BDI scores? A secondary question is whether the BDI scores are related to gender in any way. In short we'll try to gain insight into 4 (medicines) x 2 (gender) = 8 mean BDI scores. Before jumping blindly into statistical tests, let's first see if our BDI scores make any sense in the first place. Before analyzing any metric variable, I always first inspect its histogram. The fastest way to create it is running the syntax below. *Inspect histogram, see if distribution for bdi scores looks plausible. The scores look fine. We've perhaps one outlier who scores only 15 but we'll leave it in the data. The scores are roughly normally distributed and there's no need to specify any missing values. Independent observations (or independent and identically distributed variables). This often holds if each case contains a distinct person and the participants didn't interact. Homogeneity: the population variances are all equal over subpopulations. Violation of this assumption is less serious insofar as sample sizes are equal. Normality: the test variable must be normally distributed in each subpopulation. This assumption becomes less important insofar as the sample sizes are larger. The first question in our ANOVA flowchart is whether the sample sizes are roughly equal. I like to run a means table for inspecting this because I'm going to need this table anyway for my report. I'll create it with the syntax below. *Run means table and inspect if sample sizes are roughly equal. *Note: MEANS allows you to choose exactly which statistics you want. Note that this table shows the 8 means (2 genders * 4 medicines) that our analysis is all about. Each of these 8 means is based on 10 through 15 observations so the sample sizes are roughly equal. This means that we don't need to bother about the homogeneity assumption. We can therefore skip Levene's test as shown in our flowchart. We'll now run our two-way ANOVA through Analyze General Linear Model Univariate. We'll then follow the screenshots below. This results in the syntax below. Let's run it and see what happens. 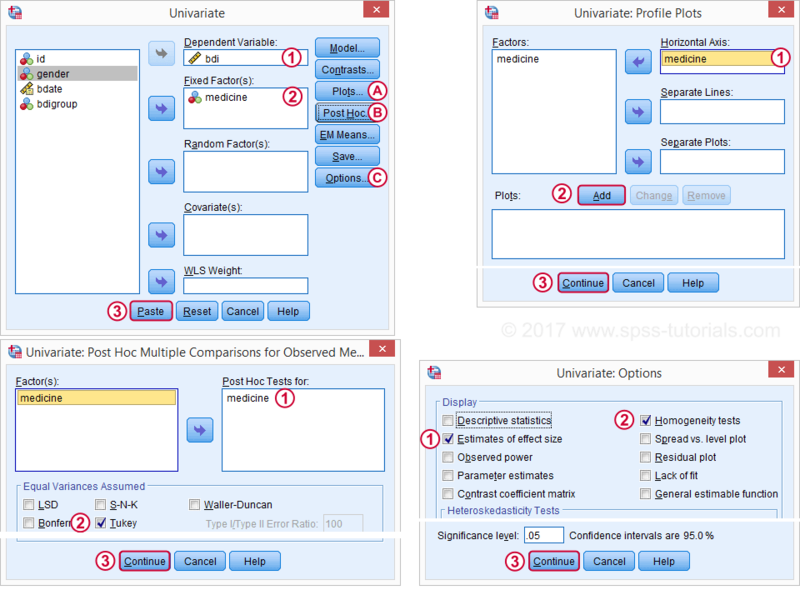 *SPSS Two-Way ANOVA syntax as pasted from screenshots. Following our flowchart, we should now find out if the interaction effect is statistically significant. A -somewhat arbitrary- convention is that an effect is statistically significant if “Sig.” < 0.05. 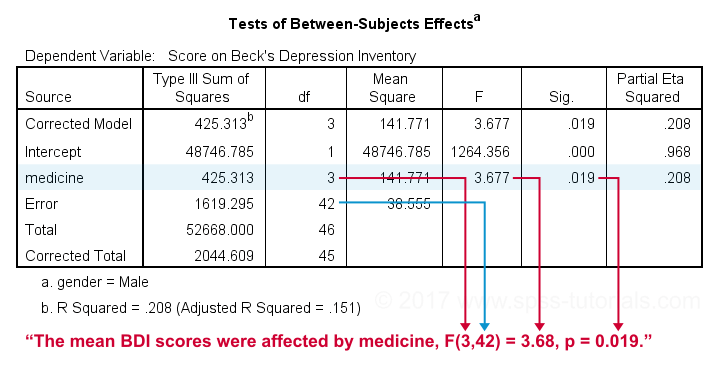 According to the table below, our 2 main effects and our interaction are all statistically significant. 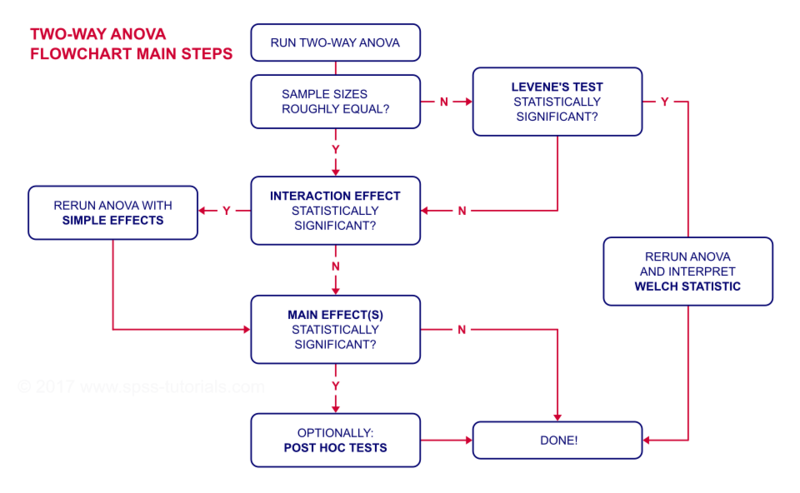 The flowchart says we should now rerun our ANOVA with simple effects. For now, we'll ignore the main effects -even if they're statistically significant. But why?! Well, this will become clear if we understand what our interaction effect really means. So let's inspect our profile plots. The profile plot shown below basically just shows the 8 means from our means table.If you ran the ANOVA like we just did, the “Estimated Marginal Means” are always the same as the observed means that we saw earlier. Interestingly, it also shows how medicine and gender affect these means. An interaction effect means that the effect of one factor depends on the other factor and it's shown by the lines in our profile plot not running parallel. In this case, the effect for medicine interacts with gender. That is, medicine affects females differently than males. Roughly, we see the red line (females) descent quite steeply from “None” to “Pharmaceutical” whereas the blue line (males) is much more horizontal. Since it depends on gender, there's no such thing as the effect of medicine. So that's why we ignore the main effect of medicine -even if it's statistically significant. This main effect “lumps together” the different effects for males and females and this obscures -rather than clarifies- how medicine really affects the BDI scores. Interaction Effect? Run Simple Effects. So what should we do? Well, if medicine affects males and females differently, then we'll analyze male and female participants separately: we'll run a one-way ANOVA for just medicine on either group. This is what's meant by “simple effects” in our flowchart. How can we analyze 2 (or more) groups of cases separately? Well, SPSS has a terrific solution for this, known as SPLIT FILE. It requires that we first sort our cases so we'll do so as well. *Interaction statistically significant? Go for simple effects: run one-way ANOVAs for male and female participants separately. split file separate by gender. Minor note: SPLIT FILE does not change your data in any way. It merely affects your output as we'll see in a minute. You can simply undo it by running SPLIT FILE OFF. but don't do so yet; we first want to run our one-way ANOVAs for inspecting our simple effects. Since we switched on our SPLIT FILE, we can now just run one-way ANOVAs. We'll use Analyze General Linear Model Univariate. The screenshots below guide you through the next steps. This results in the syntax below. Let's run it. *Simple effects: SPLIT FILE by gender and run one-way ANOVAs for males and females separately. First off, note that the output window now contains all ANOVA results for male participants and then a similar set of results for females. According to our flowchart we should now inspect the main effect. The effect for medicine is statistically significant. However, this just means it's probably not zero. But it's not very strong either as indicated by its partial eta squared of 0.208. This should't come as a surprise. The 4 medicines don't differ much for males as we saw in our profile plots. 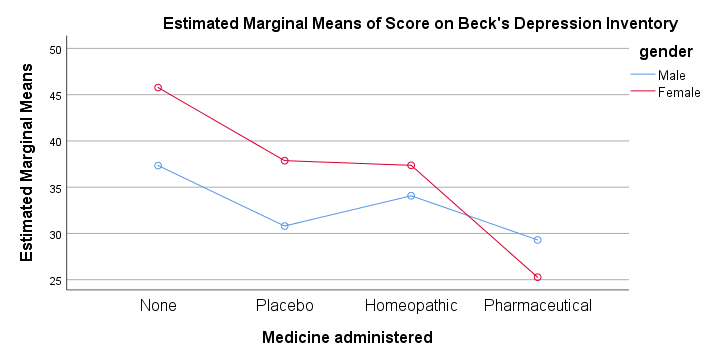 Our main effect suggests that our 4 medicines did not all perform similarly. But which one(s) really differ from which other one(s)? This question is addressed by our post hoc tests, in this case Tukey's HSD (“honestly significant differences”) comparisons. This table compares each medicine with each other medicine (twice). The only comparison yielding p < 0.05 is “None” versus “Pharmaceutical”. Our profile plots show that these are the worst and best performing medicines for male participants. The means for all other medicines are too close to differ statistically significantly. our profile plots show a much steeper line for females than for males. the main effect of medicine has a much higher partial eta squared of 0.63 for females. the effect of medicine has p = 0.000 for females and p = 0.019 for males. for females, all post hoc comparisons are statistically significant except for “Homeopathic” versus “Placebo” (p = 0.997). All these findings indicate a much stronger effect of medicine for females than for males; there's a substantial interaction effect between medicine and gender on BDI scores. And this -again- is the reason why we need to analyze these groups separately and rerun our ANOVA with simple effects -like we just did. Do you still think running a two-way ANOVA with an interaction effect is challenging? I hope this tutorial helped you understand the main line of thinking. And -hopefully!- things start to sink in for you -perhaps after a second reading. Thanks for a really helpful tutorial. I had lost a lot of my SPSS skills and this is helping revive them! First off, there's no such thing as a "simple main effect". If this difference is not clear to you, please reread the tutorial carefully. As the tutorial explains, run SPLIT FILE on one factor and then test the other factor. Thanks very much. The tutorial is very helpful. Still I need. In my data, I have two interventions across 4 different group. Would you please suggest me how to run simple main effect as I got interaction effect? Thank you! Please keep the tutorials coming! Let’s back to the example I have just mentioned in my last comment (weight reduction for different types of diets and exercises). Let the interaction between diet and exercise is significant with high partial eta squared. Suppose that you are a practitioner and you want to recommend your patient to choose a combination of diet and exercise to achieve the highest weight reduction. I think the post hoc for interaction can give the answer to the above question. If I understand you well, you suggest using 4 different ANOVAs for 3 levels of diets (or maybe 3 different ANOVAs for 4 levels of exercise) to evaluate simple effects. But I’m not sure we can find the best “COMBINATION” of diet and exercise with this procedure. Another problem with running multiple ANOVAs to evaluate simple effect is that it increases the type I error (alpha). Sorry that my sources are not in English nor online, so I cannot share them.